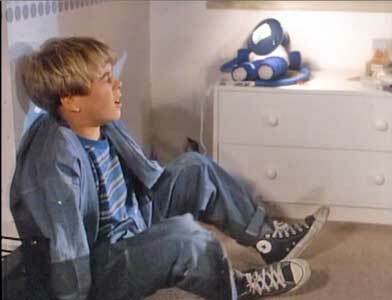 Lucas Evans and Anthony Rogers wear black and light blue high top Converse “Chuck Taylor” All Stars in the film. Ralph packs his things to go stamp travelling and recover a special stamp album. Tommy Tricker and the Stamp Traveller is a delightful family film based on the subject of stamp collecting. Tommy (Anthony Rogers) is a street-wise kid from a broken family who has discovered that he can earn good money by dealing in stamp trades, and he is not above a few scams to do this. Tommy delights in creating troubles for the local student stamp club led by Albert (Andrew Whitehead) and conning them into some bad trades. Tommy Tricker tells Nancy that he is about to mail the stamp with Ralph on it. 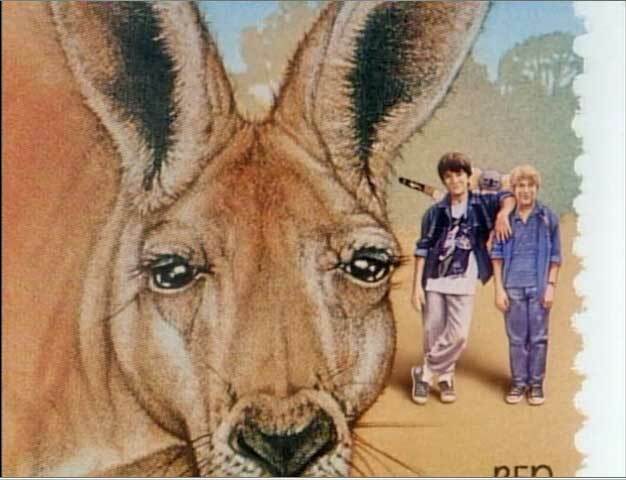 The film really is about Ralph (Lucas Evans), a shy kid and member of the stamp club who is interested making some trades, because his dad is an avid stamp collector, and he wants to be a part of the action. Tommy picks up on this, and in a pivotal scene, comes over to Ralph’s house and talks him into trading a single valuable stamp from his dad’s collection for what is supposed to be an equally valuable set of stamps. After the trade is made, Ralph discovers that he has been tricked by Tommy, and given a worthless set of stamps. Ralph tries to chase after Tommy to get his stamp back, but Tommy gets away and sells the stamp to the owner of a local stamp shop. Devastated by his loss and the fear of his father finding out about what he did, he goes to his sister Nancy (Jill Stanley) for help. Nancy consoles Ralph by telling him that she has $30 to buy a replacement stamp, but when they go to the local stamp shop, the owners tell him that the stamp they want will cost $300. When Ralph discovers a stamp that looks like the one that Tommy tricked him out of, the owners tell him to bring his dad in to prove that it was his stamp, even though they know that the stamp was the one Tommy sold them. Ralph is angered by this and leaves in disgust, while Nancy ends up bursting into tears. Upset by her reaction, the shop owners give her an old stamp album, which they think is worthless to console her. 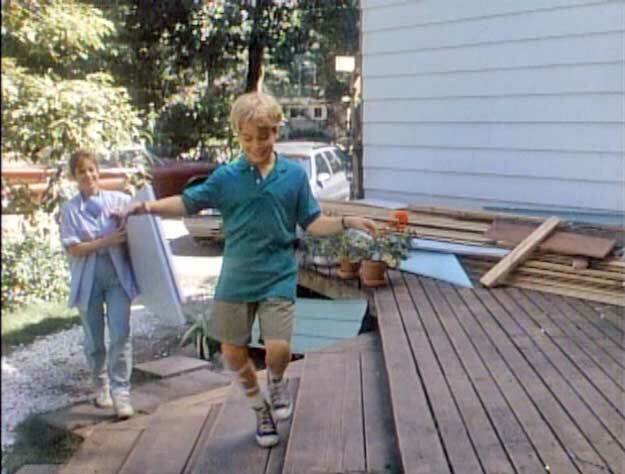 Later Ralph goes to Tommy’s house to try and get the stamp back, but he is discovered by Tommy’s dog, and ends up falling down the stairs and hurting his leg. Nancy consoles Ralph by suggesting a way to replace the stamp he was tricked into trading away. Injured, depressed, and fearful of his dad’s retribution for the loss of the valuable stamp, Ralph comes back to Nancy’s room. After bandaging his leg, she shows him the book that she got from the stamp shop. Seeing that the collection was worthless, Ralph, in a fit of anger, rips the book up and throws it against the wall, destroying the album. But by doing this, a secret letter hidden in the book is revealed, describing the location of a valuable stamp collection, and the secret of stamp travelling, which will allow a kid to miniaturize himself so that he can ride on the stamp of a letter, and travel across the world. Not sure how to proceed, but wanting to take advantage of this opportunity, Ralph asks Albert to help him figure out the process of stamp traveling. 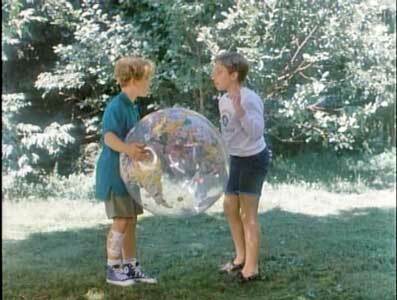 Meanwhile, Tommy, aware that something is up with Ralph, spies on them to find out what they have found out. Nancy and Tommy are both looking for the envelope containing Ralph. The next day Albert, Nancy, and Ralph go downtown to the suggested location by a mailbox to attempt stamp travelling. 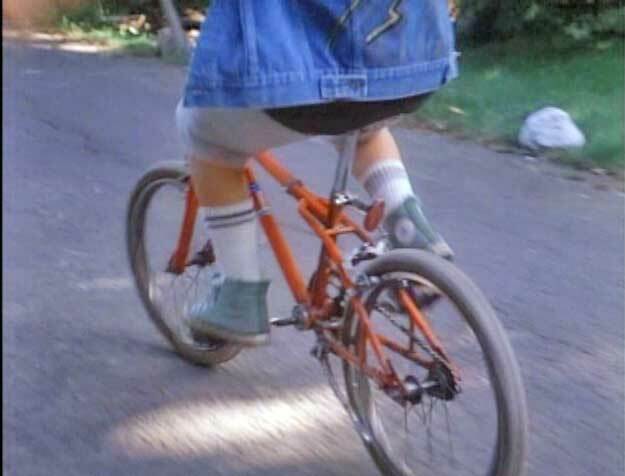 Successful in eluding Tommy, they are pursued by his buddy Cass (Paul Popovich) through a mall, but escape and Ralph recites the words that place him on the stamp of a letter. 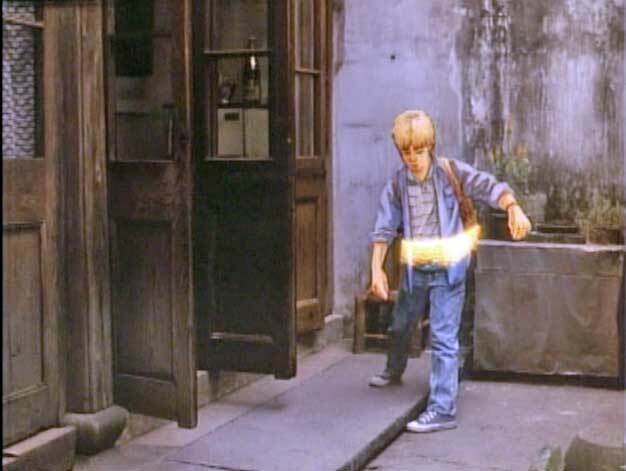 However, through a series of mishaps, Tommy eventually recovers the letter with the miniaturized Ralph, but mails it to China, while he sends himself to Australia to pickup the valuable stamp collection. 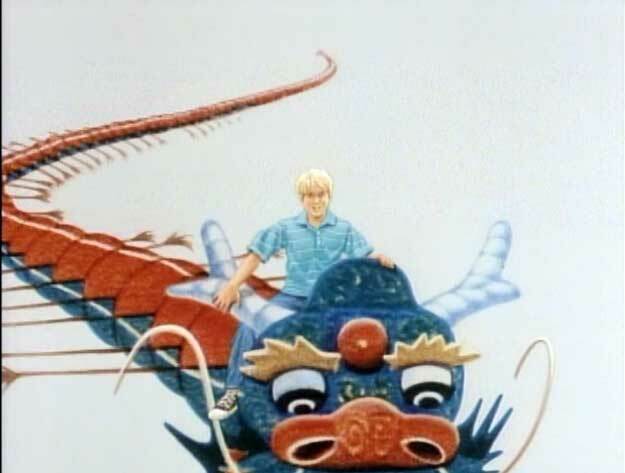 The remainder of the film deals with Ralph’s adventures in China and Australia in his attempts to find the collection so that he can compensate his dad for the loss of the valuable stamp taken by Tommy. Ralph and Albert figure out the location of the hidden stamp collection. Writer-director Michael Rubbo has created a family film that appeals to all ages because it shows kids in a different environment than we normally see in this genre. Part of this is because the film was produced in Canada, so we don’t see the usual emphasis on American sports or media, but the thing that makes this film so charming is the way that it shows kids as creators and thinkers. A perfect example of this is how one of the film’s songs is introduced. 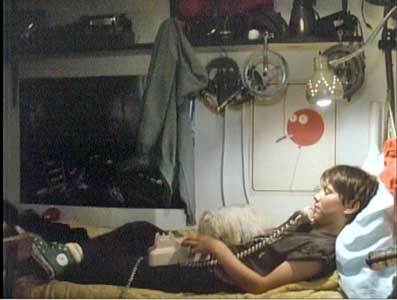 At the beginning of the film, we see a classmate (Rufus Wainwright) of Ralph and Tommy sketching out a song. Later, during the chase scene at the mall, you see him performing the the song with his band as an accompaniment to the action. With its focus on finding a hidden stamp collection, we see the characters in the film using deductive reasoning to figure out solutions and because of the world travel that occurs in the story, the film gives us a similar view of kids in China and Australia. As the main character Ralph learns to deal with his fears and frustrations,while striving to find the hidden stamp collection, we see him gradually emerge from an insecure, stuttering personality to one of courage and determination, willing to take chances and solve problems. Ralph goes to Nancy for help after falling down Tommy’s stairs and hurting his leg. 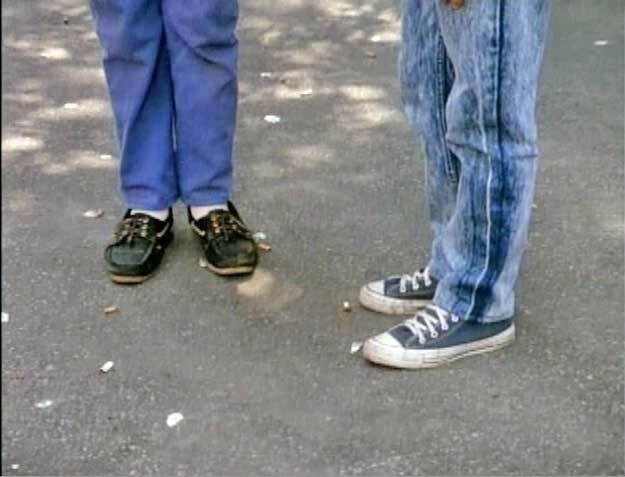 Tommy Tricker and the Stamp Traveller is filled with great chucks shots as both main characters Ralph (black) and Tommy (light blue) wear high tops throughout most of the film. Director of Photography Andreas Poulsson deserves credit for his approach to the cinemaphotography of the film, which continually shows us chucks shots in almost every scene. 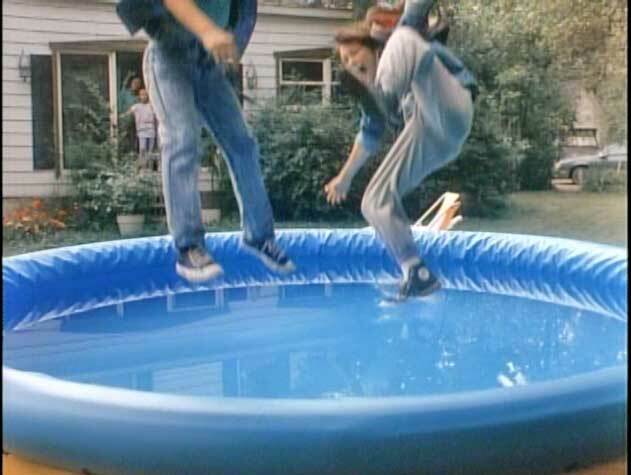 Besides the pictures of the lead characters, you see a variety of incidental shots where bit players are also wearing chucks. Because of the stamp travelling, there are also original shots of stamps with Ralph and Tommy wearing their Chuck Taylors on them. In fact there were so many good shots, it was hard to settle on one particular scene, so look below for groups of pictures presented in thumbnail. (Click on the thumbnail to see the full sized picture.) These shots fall into three categories: chucks closeups, stamps, and Ralph action shots. 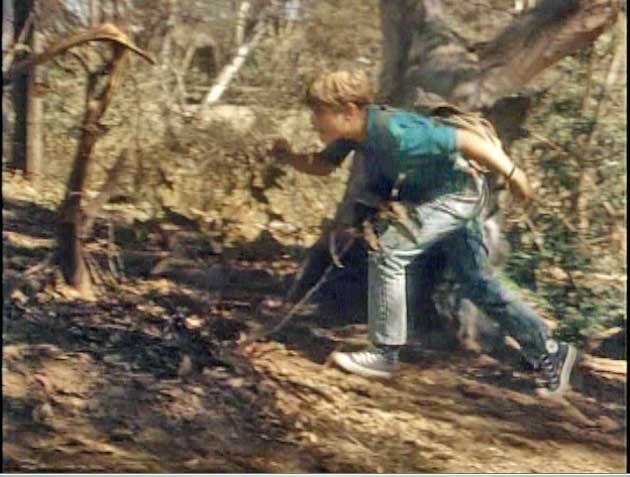 Tommy on his bike, Albert and Ralph look for the precise spot to drop the envelope, and Tommy and Ralph fall into the pool at the end of their journey to Australia. The first three stamps with chucks on them: Ralph with a Canadian mountie, Ralph riding a Chinese dragon, and Ralph and Tommy with a kangaroo. Ralph doing his Charlie Chaplin imitation, being re-transformed to regular size, and running to rescue Tommy from Cheryl’s uncle. 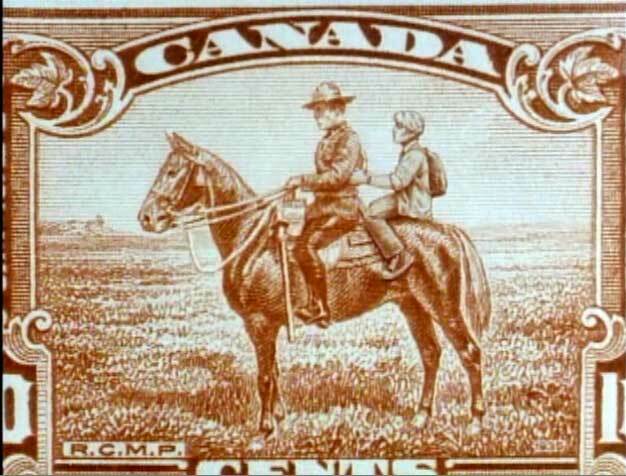 Tommy Tricker and the Stamp Traveller. (1987) Lucas Evans, Anthony Rogers, Jill Stanley, Andrew Whitehead, Paul Popovich. Directed by Michael Rubbo. Categories: Family, Comedy, Science Fiction/Fantasy.